You read that correct, it's more carrots and less sticks for you to go green. In case you missed this piece of news, in brief, it talks about the government's plan to enable you to get financing so that you can generate extra income through installation of solar PV at home. It did not give further details but from my conversation with a couple of industry players, one can get up to 90% financing, which means down payment of only RM4,500 to RM6,000. Furthermore, the cost per kWp of solar PV is decreasing rapidly in tandem with technological advancement. 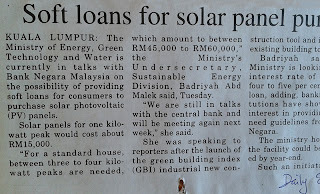 In fact, according to one system integrator, as of today (June 2011) the cost per kWp is already down to RM14,000. Implementation may not be that fast as application will only be open to the public in 3Q and possibly implemented in 4Q of this year. I mentioned 'less stick' earlier on, let me explain. 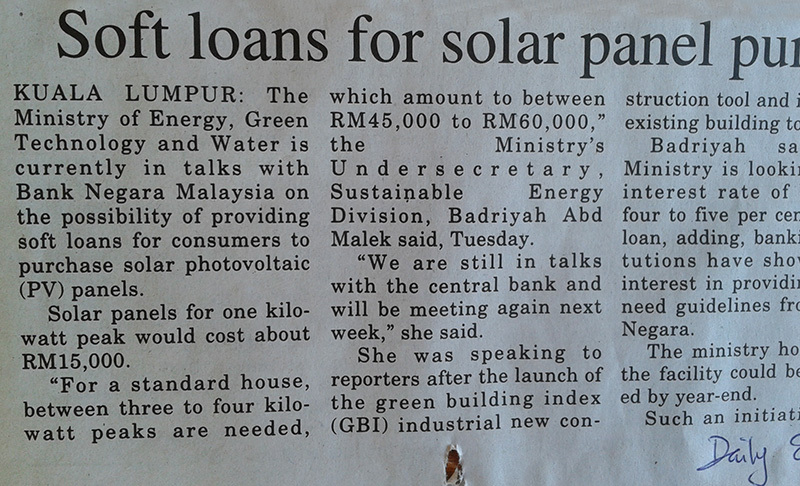 Application to install solar PV at home is on quota and first-come-first-served basis. Let's assume you successfully get the allocated power aggregate for this year's implementation. Terms and Conditions states that you MUST install your system this year as indicated in the agreement. In case you decide not to install, you will not get 'caned', you merely pass the opportunity to someone else. If you decide to 'pass' this opportunity to someone else, you've missed on the opportunity to generate extra income while sitting doing essentially nothing. If you feel like reading, view the full story here by Bernama.